“DataONE: the Data Observation Network for Earth is a distributed cyberinfrastructure that meets the needs of science and society for open, persistent, robust, and accessible Earth observational data. DataONE has dramatically increased the discoverability and accessibility of diverse yet interrelated Earth and environmental science data. In doing so, it has enhanced the efficiency of research and enabled scientists, policy makers and others to more easily address complex questions about our environment and our role within it.” Read More. The Panama Canal was officially opened 100 years ago on August 15, 1914, ten years after the United States assumed control of the project. Construction had been started by France in 1881 but ultimately faltered due to cost overruns and the high mortality rate experienced by the construction workers. Once the United States took over there was a need for highly skilled engineers. Several alumni from Dartmouth's Thayer School of Engineering were involved in the project. Robert Fletcher went to visit the canal in May 1913, during the latter part of construction. While there he saw a number of Dartmouth and Thayer alumni. Among them was Herbert Hinman (Dartmouth 1907, Thayer n1908) - in charge of the Balboa terminal work and earlier superintendent of work on the Pedro Miquel locks. Fletcher also mentions Otis Hovey (Dartmouth 1885) who designed and constructed the canal's emergency dams, and Fred Stanton (Dartmouth 1902, Thayer 1903). 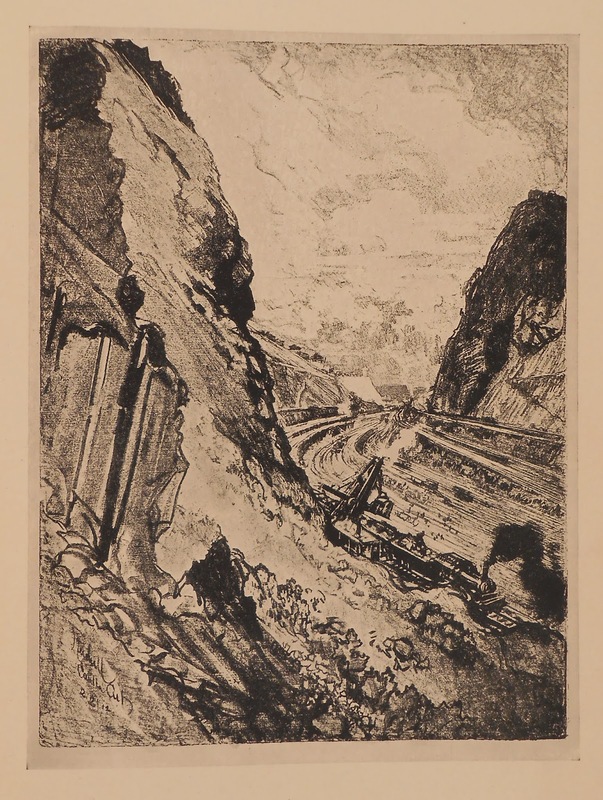 Pictured here are several lithographs from Joseph Pennell's Pictures of the Panama Canal (Philadelphia, London: J.B. Lippincott Company, 1912) that depict places mentioned in Fletcher's diary or in letters from alums to Fletcher. The Culebra Cut is mentioned in a letter from Stanton to Fletcher from July 25, 1913. "It was a great pleasure to have you here when the Canal work was in its most interesting stage. The Culebra Cut will be flooded about October tenth, so you weren't here any too soon." The Gatun locks appear in one of Fletcher's diary entries. "Langley met me and went over the Gatun Locks end to end and into some operating chambers in the middle wall. In the lower approach excavation 42 ft. below sea level." 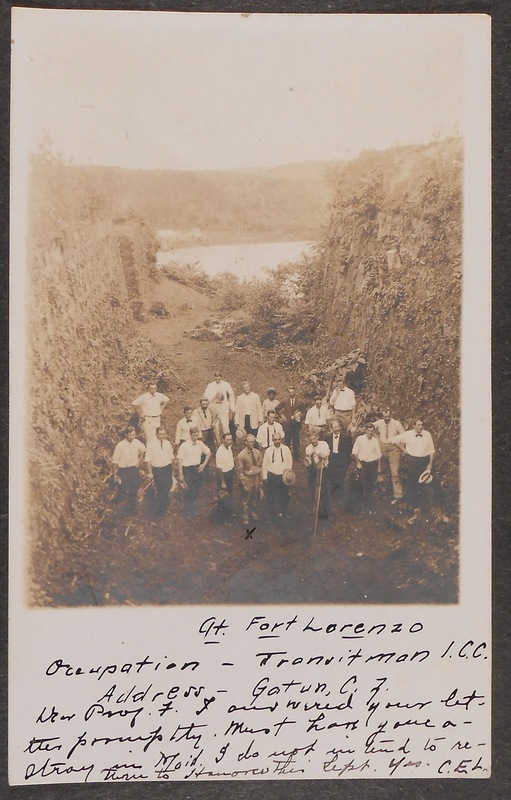 A postcard in Clarence Langley's (Dartmouth 1907, Thayer n1908) alumni file bears the inscription: "At Fort Lorenzo. Occupation - Transitman I.C.C. Address - Gatun, C.Z. Dear Prof. F. I answered your letter promptly...I do not intend to return to Hanover this Sept." I.C.C. stands for Isthmian Canal Commission, C.Z. for Canal Zone, and Prof. F. is Robert Fletcher. More letters indicate the scope of the project and the cost. 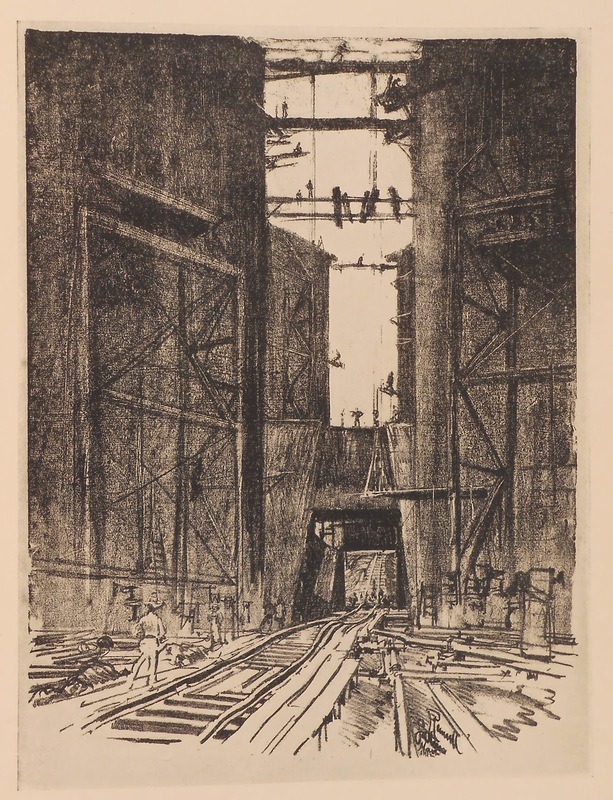 Fred Stanton wrote to Fletcher on September 10, 1907: "The work which I will be engaged in consists of removing some eight millions cubic yards of rock and about five millions of sand. I expect to find the work very interesting and instructive…." Another alum, Clarence Pearson (Dartmouth 1907, Thayer 1908), worked at the Gatun Locks and left the Canal Zone in 1910 due to poor health. He died in 1911 and is mentioned by Hinman in a letter to Fletcher, ca. 1911: " We are still fighting it out on the same old lines down here but we lost poor Pearson. I think his death was a direct result from this work." 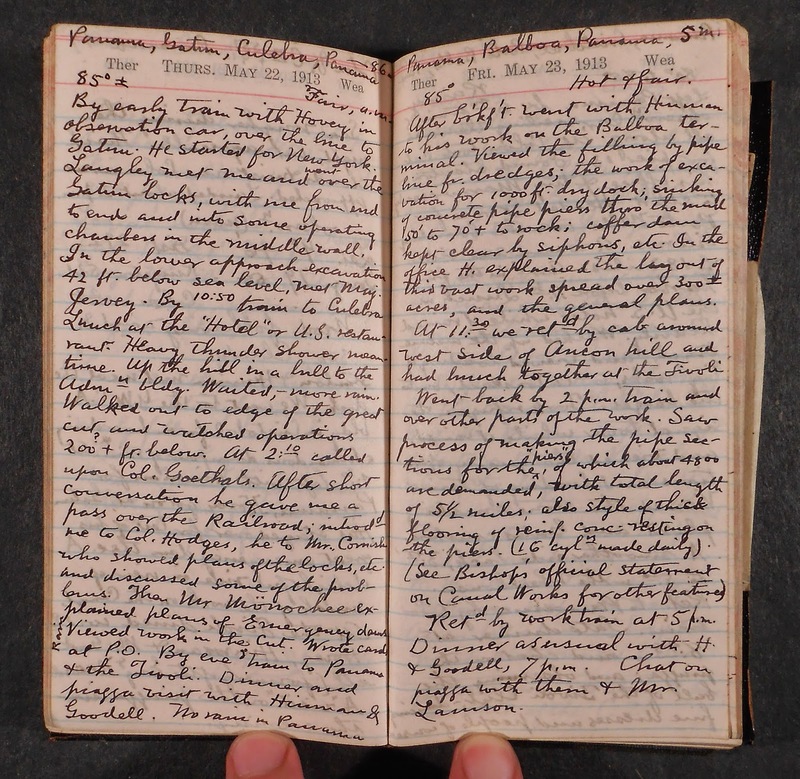 Ask for Robert Fletcher's diary from 1913 (DA-4, Box 2234, folder 2) and the alumni files for the Thayer School (DA-4, filed by class year). The Pennell illustrations can be seen by asking for Illus P382pe. We were recently reviewing a large number of older books that were originally part of the Thayer School's engineering library. Tucked in among the books with beautiful engraved plates was a small practical treatise Geodaesia: or, the Art of Surveying (New York: Samuel Campbell, 1796). Book is not particularly rare, but the front flyleaf caught our eye. 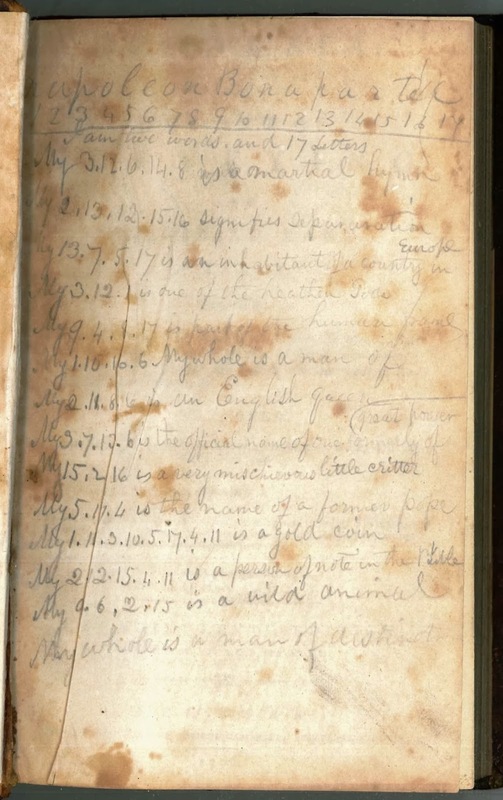 It contains what appears to be 14 lines of verse with coded words inserted. What might we have found? Forbidden love? No, the key is present--it is just a simple substitution code based on Napoleon Bonaparte. There was no challenge in deciphering the words. Instead, it seems to be a bit of parlor game fun perpetrated by James W. Rollins, class of 1845 who signed the book numerous times. Below is a transcription of the verse with the decoded words bracketed. 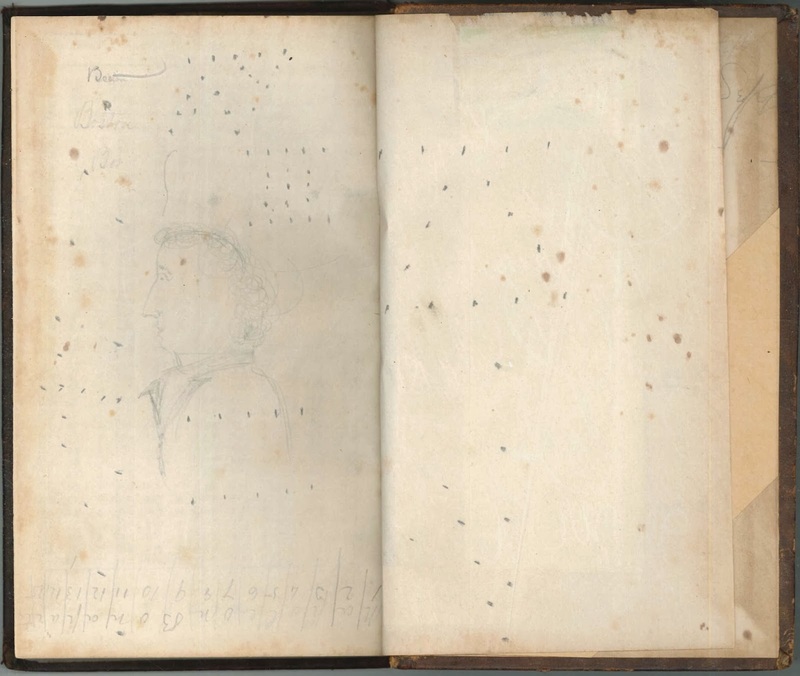 More intriguing is a series of dots on the back flyleaves with a sketch of Napoleon and the same key. This probably required a sheet to be laid over the dots to reveal their secret message. Based on the Napoleon code, we doubt anything too earth shattering is hidden. Still… one never knows. To decode it, ask for Rauner Thayer TA544.L89 1796. MIT-based researchers Marcelo Coelho and Skylar Tibbits have teamed up to improve the limitations that the 3-D printer’s size has on what can be printed. Published on May 2, 2013 May 3, 2013 Author Rena MosteirinLeave a comment on Formula Hybrid Live! Curious about Formula Hybrid Racing? Formula Hybrid challenges college and university students to design, build, and compete high-performance hybrid and electric vehicles. Building on the Formula SAE program, Formula Hybrid adds an extra level of complexity: fuel efficiency. With technological challenges for students with backgrounds in electrical, mechanical, and computer engineering, Formula Hybrid encourages interdisciplinary teamwork and innovation. Published on May 2, 2013 May 3, 2013 Author Rena MosteirinCategories Feldberg Business & Engineering LibraryTags EngineeringLeave a comment on Formula Hybrid Live! Feldberg Library, located between the Tuck School of Business and the Thayer School of Engineering, is situated at the intersection of entrepreneurship and engineering. We celebrate these crossover collaborations and are excited to highlight this new product, pioneered by Dartmouth’s own Riley Ennis ’15, Rob Lauzen ’15, Katherine Franklin ’15 and Kiah Williams ’15. Click on the image above to learn more about these students and their smartphone app for early disease detection. Ever wonder about the weather in space? The amazing work of Thayer Professors Lotko and Shepherd is profiled in the latest Dartmouth Engineer. Watch the video or click on the above image to link back to the article for more details. Dartmouth Humanitarian Engineering’s (DHE) small-scale hydropower system is a cost efficient way of bringing electricity to isolated villages that are decades away from being connected to the grid. The system is powered by diverting water from the top of a waterfall, feeding it into a turbine that generates electricity to charge batteries. Since the cost of implementation and maintenance are low, the price to charge batteries is affordable even for people in rural areas of developing nations. Our hydropower systems improve the quality of life in poor villages by supplying the energy needed to foster local business, raise the standard of living, and make a positive environmental impact. Not only is hydropower self-sustaining; it also has an overwhelmingly positive environmental impact, including reducing greenhouse gas emissions, improving individual health, and preventing deforestation. In creating very small-scale hydroelectric sites, DHE provides clean power without creating the environmental destruction associated with larger sites. Our systems stimulate economic development and education by allowing entrepreneurs and students to use cheap electricity during any hour of the day, promote a positive environmental impact by reducing Africa’s carbon footprint, improve individual health by limiting the cases of lung cancer and other respiratory diseases diagnosed each year, and overall raising the standard of living for the inhabitants of rural Africa. Our system has worked successfully in Banda and Rugote. With the help of DSIC, we envision proving the profitability of small-scale hydropower such that entrepreneurs in the developing world will install these sites without our assistance – that’s our solution to the problem of rural electrification. 2. Check that email, and click the confirmation link.